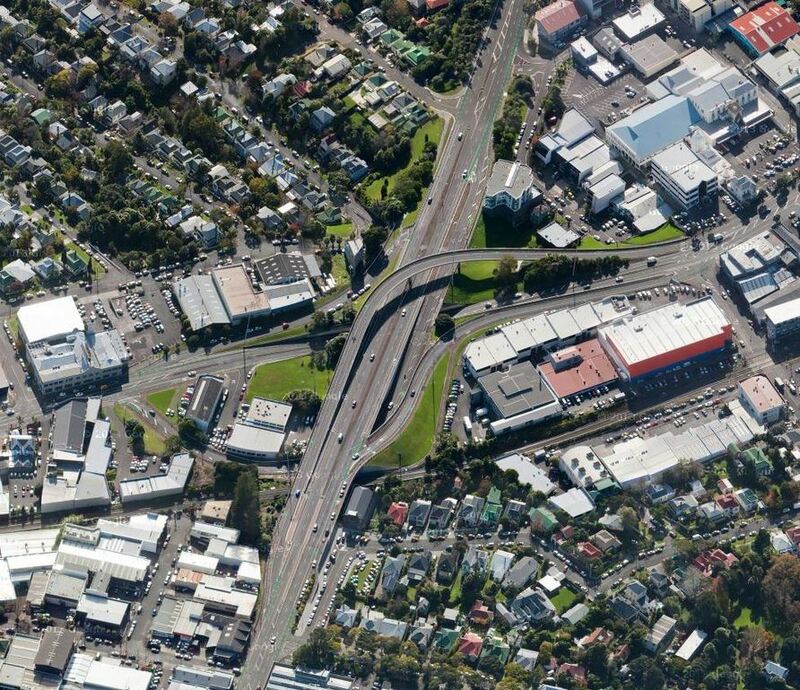 Days Numbered for Dominion Road Flyover? People have long wondered about the purpose and need for the flying viaduct which curves high above the Dominion Road/New North Road intersection. Last year Albert-Eden Local Board member Graeme Easte proposed demolition of the interchange and replacing it with a much more human-scale and pedestrian-friendly environment. This would free up 2-3 hectares of valuable land which could be used both to pay for the project and to create a new City Centre-fringe community of apartments, shops and cafes. The recently established Panuku Development Auckland confirmed at a Local Board briefing yesterday that they are studying the proposal, along with Council’s urban design planners and Auckland Transport. 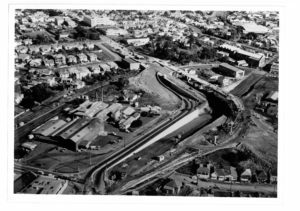 The Dominion Road interchange was built in 1967-68 by Auckland City Council in anticipation of the then proposed Dominion Road motorway which would have been an eight (sic) lane road running parallel to Domionion Road from Newton Gully to Mount Roskill. Shortly after its completion the proposed motorway was cancelled, making the interchange redundant. What is now Ian McKinnon Drive was intended as a temporary link road but has now become a permanent fixture. Although the interchange allows free-flowing vehicular traffic it is not a very pleasant environment for pedestrians and cyclists and in any case does not cater for all movements – for example the link between Dominion Road from the South and New North Road West of the intersection is via George Street and its level crossing. Because of its larger than necessary footprint, the interchange forms a significant disjunction hundreds of metres in extent between communities and activities on opposite sides, whereas a conventional intersection, even a very busy one, would be only 20-30 metres wide. 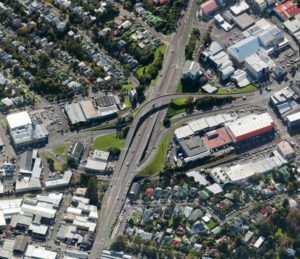 Although removal of the interchange will likely cost $10-15 million, this will be balanced and hopefully out-weighted by the value of the real estate freed up for development – land in this area is now worth over $2,000 per square metre. In 2005-06 Montreal spent $27 million removing a similar but more elaborate monstrosity (at Parc et Avenue des Pins) and replacing it with a light controlled cross-road intersection, specifically to create a more humane environment. Redevelopment of the intersection will also allow closure of the two nearby level crossings and cater well for the proposed light rail lines planned for Dominion and Sandringham Roads. Major road works are very disruptive but fortunately this structure includes the seeds of its own destruction. The cavernous underpass under Dominion Road was used during construction as a two-way bypass to carry all New North Road through-traffic as can be seen in the fascinating photo above. This bypass could be very easily re-instated during the period of demolition, saving expense and time while minimising disruption to road users. Because of the imperatives of the CRL and light rail projects, it is likely that this project will be realised sooner rather than later. Albert-Eden and Waitemata Local Boards share the area around the proposed intersection so Board Members look forward to collaborating together to design a master plan in conjunction with local residents and Council agencies.